Based on research from the renowned Search Institute, this groundbreaking critique of American culture offers practical strategies for uniting and mobilizing communities around a shared vision of healthy development. Peter L. Benson introduces forty developmental assets-building blocks of healthy development. These assets-such as family support, intergenerational relationships, clear and consistent boundaries and expectations, participation in constructive activities, and community focus on values-are essential for all youth, regardless of background. Yet too few young people have these support structures in their lives. 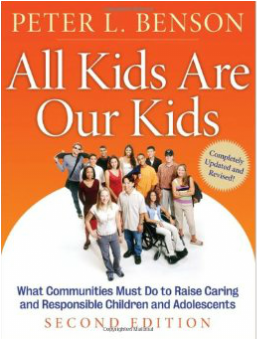 To increase assets among all kids, the author provides a compelling vision for a healthy community and specific recommendations for individual, family and community action. This persuasive book demonstrates that building these developmental assets is critical for communities and society. When young people experience more of these assets, many forms of high-risk behavior sharply decline, including alcohol and other drug use, too-early sexual activity, violence and school failure. And just as significantly, increasing a young person’s developmental assets enhances the competencies and skills necessary for healthy adulthood. Good families are not enough.